Prince’s Barn has been tastefully restored and furnished with oak doors, windows and floors. 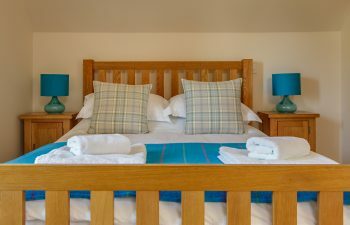 The ground floor rooms have under floor heating with the option to set individual room temperatures. The open plan sitting and dining room is equipped with an electric log burner, TV, Sky, DVD/Blu-Ray player and WiFi. The glazed doors separate the dining room from the kitchen. The light and airy kitchen is fully fitted and equipped and includes a breakfast area. Beyond the breakfast area there is a garden bedroom, which has super king size bed (or twin zip linked beds) with an ensuite shower, TV and Sky. A fully glazed wall looks onto the courtyard garden. 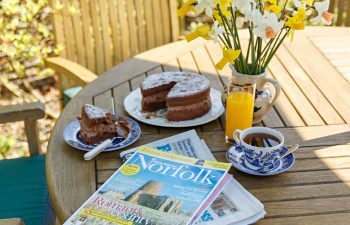 The enclosed courtyard garden includes seating and a BBQ and can be accessed from the breakfast room, sitting room and parking area. Leading from the hallway there is a single bedroom and a wet room also suitable for the less mobile guest. The upper floor has two carpeted king size double bedrooms, one of which has French windows with a Juliet balcony overlooking the pond. These two rooms share a family bathroom which includes a ‘P’ shaped bath with shower. All the bedrooms have fitted wardrobes. Food and provisions can be found in Horning. Wroxham and Stalham have supermarkets and a wider range of shops. Groceries can be ordered and delivered ready for your arrival if required. 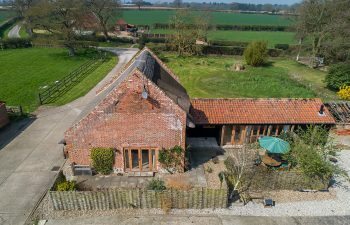 Prince’s Barn is accessed by a ramped apron and the ground floor is on one level throughout with no steps easing access for the less mobile. The patio garden and BBQ can be accessed through three double doors one of which has a ramp. We are dog lovers and welcome pets to stay on the ground floor and ask that pets are not left unattended. The area is ideal for cyclists and walkers whom are welcome. A secure store, with cycle racks and a boot/clothing drying room is provided.